CASA LUNA DE MIEL Oceanfront on Private Beach w/Awesome Pool! Welcome to Playa Negra Vacation Rentals, Jarrod and Meaghan, where we do our best to ensure a wonderful stay in Playa Negra. *Please see notes for proper rates! Oceanfront elegance awaits you at Casa Luna de Miel, “The Honeymoon House”. Enjoy your days lounging by the ocean front pool and nights star gazing on the third story star deck. This tropical romantic getaway was recently refurnished, with handcrafted furniture, high quality mattresses and new windows. The second floor wraparound deck will welcome you at any hour of the day, whether enjoying your first cup of coffee in the morning, an after lunch siesta in the hammock and finally watching the sun set into the Pacific Ocean with orange pink fired skies. Walk a short distance in our gated community to Playa Negra, Sandy Beach, and more for surfing, beach combing, dining, sunset drinks, and long stretches of uncrowded beaches . Casa Luna de Miel also features a 24 hour private guard service that is shared with nine other homes in the same community. HOME INTERIOR LAYOUT: Ocean Front Casa Luna Miel is a two story, 2 bedroom/ 2 bathroom private home. This is a great for a couple or a family, this house sleeps 6 comfortably. The whole home features vaulted teak ceilings in all rooms and newly installed Pella windows. BEDROOMS: An amazing master suite features a king size bed canopy bed, large armoires and an attached private bathroom. The second bedroom features a queen bed and a unique handcrafted bunk bed. The tropical themed living, dining and kitchen areas are located ocean front and have an open floor plan. The third story features a large star deck with built in benches and amazing ocean views. The first floor features a pool and lounge area again with ocean views. **This home also has WIFI, telephone and satellite television to keep you conncected. OUTSIDE enjoy the beautiful private infinity edge POOL with its own waterfall that all faces the Pacific Ocean. Casa Luna Miel has private parking, a private outdoor shower, a BBQ and plenty of outdoor seating. WHY PLAYA NEGRA? You're probably looking at multiple locations in Costa Rica. If a selection of uncrowded beaches, wild-life, a laid-back atmosphere, no high rise buildings, no franchises, multiple surfing breaks and tranquility are on your vacation agenda. Then the beach town of Playa Negra is a great place to kick back and enjoy your much needed time off. In Playa Negra you can capture the way Costa Rica used to be. If you want to visit a tourist town, it’s only half an hour drive to Tamarindo for shopping, Subway, the US style grocery store the 'AutoMercado' and shop after shop of souvenirs. HELP IS JUST AN EMAIL OR PHONE CALL AWAY: This home is managed by Jarrod and Meaghan with Playa Negra Vacation Rentals, we manage 15 other properties in the area. If you would like to see other reviews of homes we manage check out the following VRBO listings: 186735, 263153, 240492, 261053. We are a phone call or email away to answer any questions, home questions, book tours, help with directions, but most importantly to help you make this a memorable and relaxing vacation. WHAT WE OFFER: Let us help you plan and enjoy your time in Playa Negra through tours, day trips, fishing trips, rental car assistance, airport shuttles, and in house services. We will be there from beginning to end to help you with your vacation, please let us know what you need and we will gladly help you. BEACHES: Enjoy a small beach directly in front of the house, this beach is mainly rock with many tide pools to explore. Through the gated ocean-front community, stroll 5 minutes on palm and hibiscus lined roads to the Playa Negra Reef Break, Sandy White Swimming Beach and Open-Air Restaurant and bar. It is a short 5 Minute Drive to Playa Avellanas North (white sand, reef/ sand surfing, restaurant), and 15 minutes drive to Playa Junquillal South (black sand, beach break surfing). We will be glad to point you to other beach options in the area. LOCATION: This home is just under 2 hours from the Liberia Airport and 4 hours to the San Jose Airport. It is just 20 minutes to a great Zip-Line tour, or take a sunset horse-back tours leaving directly from Casa Luna de Miel. 50 minutes away from a covered river boat ride full of wildlife. 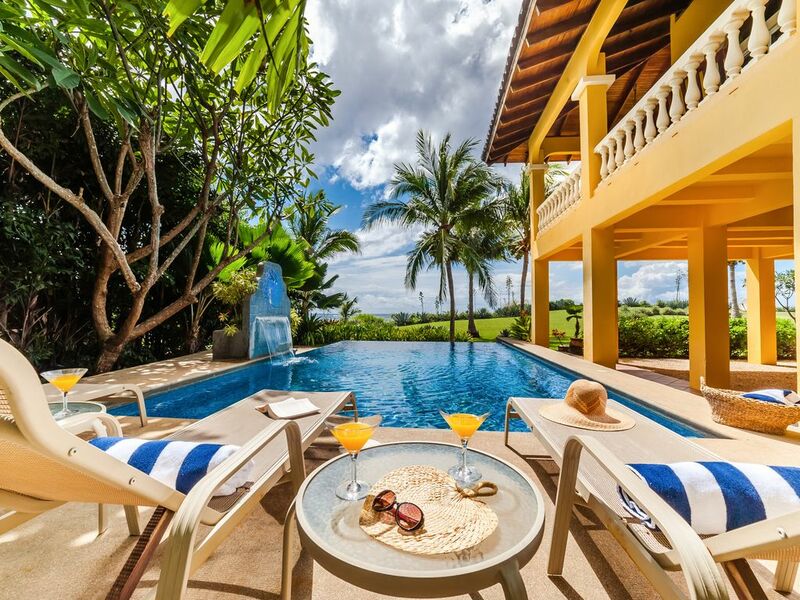 20 Minutes to Hacienda Pinella Beach Club and Spa, 35 minutes to Tamarindo for shopping, under 3 hours to Rincon De La Viejo Park (canopy tour, river tubing, waterfalls, horse back rides & hot spring mud baths). Or just let us set up an in home massage and a private cook to take all your worries away. LOCAL DINING: Playa Negra has 8+ great restaurants in town, including Peruvian fusion at Cafe Playa Negra, Beach-front seafood on the wood grill at Hotel Playa Negra, amazing sandwiches and baked goods at Cafe La Ventana, Excellent fish tacos at Jalapenos, tropical dishes at Pura Vida Pizzeria, yummy traditional fare at Bar Latina, wood burning oven pizza at Kontiki, and even an amazing 5 star chef with a large wine cellar at Villa Deevena. Great views and close to great waves. Very quiet town and great neighborhood. Oceanfront with very private beach out front. We absolutely loved staying here. Could have stayed another month. (We were there for 8 nights). All of the amenities you could think of and need. Great views, a private pool right there, nothing but a yard between you and the ocean. I would say the only negative(even though it didn't bother me) was the dirt road you drive in on(approximately 20 minutes, slow). Fabulous home! If you are looking for an out-of-the way and peaceful vacation, Casa Luna De Miel is the house you want to rent. I loved the stone wall in the livingroom. The beds were quite comfortable. The landscaping around the house was amazing. The views from the house and pool of the ocean were fantastic. One day we had wild ponies in the back yard. We had fun walking on the beach at low tide looking for shells. My son and grandson wanted to come to Playa Negra to surf. You can park near the Playa Negra hotel/restaurant for a small fee and walk to a sandy beach and where the surfers all congregate. There were surfers from all over the world visiting Playa Negra. Everyone was friendly that we met. There are a few restaurants in Playa Negra. Kon Tiki has great pizzas. My husband and I had a good American breakfast at the Playa Negra Hotel while watching the surfers. Prices are similar to restaurants in Florida. Not much in the way of shopping at Playa Negra. Definitely buy all of your groceries before you get there. We had stayed a week earlier in Tamarindo so we bought groceries and souvenirs in that town. The dirt/stone roads getting to Playa Negra are a little bumpy. You have to go slow and avoid the pot holes. I was glad it did not rain while we were in Playa Negra. Meaghan and Jarrod, the managers, kept in touch with us throughout our visit to make sure we were comfortable and had everything we needed. This was the nicest house we have ever rented with VRBO. We loved this house! Beautiful, comfortable, spacious and an amazing view! We felt very safe and cared for by the security team and Jarrod and Meghan. I highly recommend this house and Playa Negra Vacation Rentals. Though everyone said that we were going off season, it was completely perfect in every way. The house is gorgeous, private pool is wonderful, the oceanfront property is awesome!!! I love having the loaded kitchen so we could have breakfast, lunch, dinner on the wrap around balcony overlooking the ocean and sunsets. The only negative thing I could say is I wish I could have stayed longer. Tip: Get massages at home!!! Our family of four stayed for a week at Casa Luna de Miel as part of our three week vacation to Costa Rica . This was our 2nd stop and it was perfect ! It is located in a very private community and we rarely saw other people. Every morning we enjoyed coffee and breakfast on the amazing wrap around porch listening to the waves and admiring the view. As I write this review I still can't believe we we fortunate enough to be able to stay here. The home is just like the pictures and video show but only better !! We spent a lot of time in the beautiful pool which was always the perfect temperature. The bedrooms and living and dining rooms all had ac and all the rooms had great ceiling fans to keep the house cool. The kitchen is well stocked and we cooked most of our meals, why would you want to go out to eat when you have this amazing view. The living room is very comfortable and has a good selection of DVDs, games( we had a few monopoly nights) and a good satellite package to those wanting to watch tv. Swimming and surf beaches are a short car ride or walk away and the water was very warm. The guards at the gate always greeted us with a smile as we would come and go and Makomba the community dog spent a lot of time with us. The house has a washer/ dryer in the garage stocked with detergent and a new bbq . Playa Negra was the perfect location for us; secluded, quite, and beautiful but close enough to activities and the tourist town of Tamarindo ( we made a few trips to the auto mercado for groceries, very much like a US grocery store) and a short drive to Lola's for lunch and drinks. Our favorite place to grab a bite in the area was at Cafe Playa Negra, very good food and friendly service. When we arrived it was the beginning of the rainy season and we did have some rain each day which was always very brief and a nice cool down. Hummingbirds, butterflies, birds, and other wildlife provided great photo opportunities. Meaghan and Jarrod were fantastic! Always available to answer questions and help if you needed anything. We enjoyed meeting and talking with them and hope to return to one of their properties that they manage in the near future . This was our first trip to CR and we can't wait to return. It was also our first non resort vacation and everything went smooth and better than I imagined it could be. The abundance of nature and beauty of the land as well as the kindness of the people makes Cosa Rica a place I recommend to everyone. Thank you so much for such a wonderful review. We are so glad we were able to be part of your vacation. We really hope we will see you again soon!! My wife and I spent six weeks in perfect weather in this spacious, lovely home. We had visitors for two of those weeks. The house, pool and grounds were just as we expected them to be. Very comfortable and everything works well. Lots of good restaurants close by. Jarrod and Meaghan provided top-notch help and advice.